Japanese horror junkies are in for a treat with the latest Ringu movie! 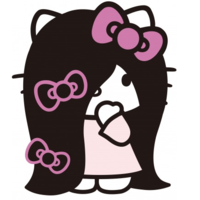 Promotions for Ringu 3D have been out and about, starting with the Sadako 3D X Hello Kitty collaboration that began nearly a month ago. Then, almost a week ago, Sadako Yamamura threw the ceremonial opening pitch for the Chiba Lotte Marines vs Hokkaido Nippon Ham Fighters baseball game. Now, about 50 individuals dressed as Sadako crawling out of televisions promoted the movie in the streets of Shibuya. Ringu began as a movie based from the novel Ring written by Suzuki Koji. This world famous horror movie that spawned Korean and American versions of the tale was based on the Japanese ghost story, the Bancho Sarayashiki. The original Japanese movie was directed by Nakata Hideo and had such a huge following. Most of the Ringu stories were printed as manga. Sadako Yamamura is the horrifying ghost of a young girl drowned inside a well. Her curse spreads through a video tape she created psionically that shows unrelated images. Viewers have only a week to live unless the video tape is copied and given to other victims to be viewed. In the first Ringu movie, reporter Asakawa Reiko and her ex-husband, Takayama Ryuji, tried to release Sadako’s spirit but to no avail. Ryuji dies in the same way Sadako’s other victims have. Asakawa realizes that there is no end to the curse and must be given to another person. Ringu 3D will be released in theaters on May 12, 2012. For those who missed the opening pitch, check out the video below.